Wow, we’re absolutely stunned, but we just won first place at the NetSquared Challenge! 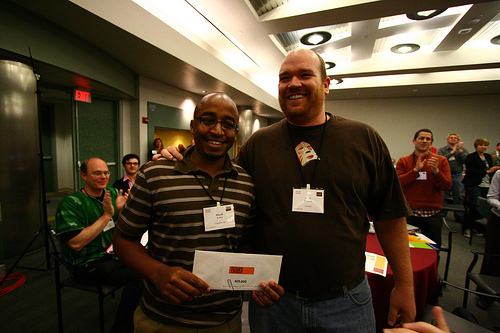 That means we have a check for $25,000 that we can spend on further development of the Ushahidi Engine (version 2). More important than the money for us though is the validation that we got from the community at large for our mission. It’s the Kenyan and African community that got us here, and the NetSquared community that voted for us to win. A special thank you to NetSquared for making this possible. To everyone who has supported us, a BIG thank you. We’re not done with you yet though. We hope that you will continue to be a part of the greater Ushahidi community. Helping us develop the platform further. Helping us spread the word. Most of all, helping us implement it in crisis situations. Build a verification process that can be based on technical information gathered in the the reporting of the information (geo-location of incident submission) or it can be based on a verification process where a verifier confirms the details of the incident. â€˜Lens Viewâ€™ visualization of the data, for example a multimedia â€˜lensâ€™ to filter the content for the public or press.